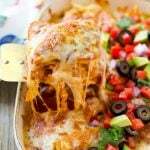 This easy recipe for chicken enchilada casserole is layers of tortillas, shredded chicken, enchilada sauce and cheese, all baked together to golden brown perfection. A quick and simple meal that the whole family will love! 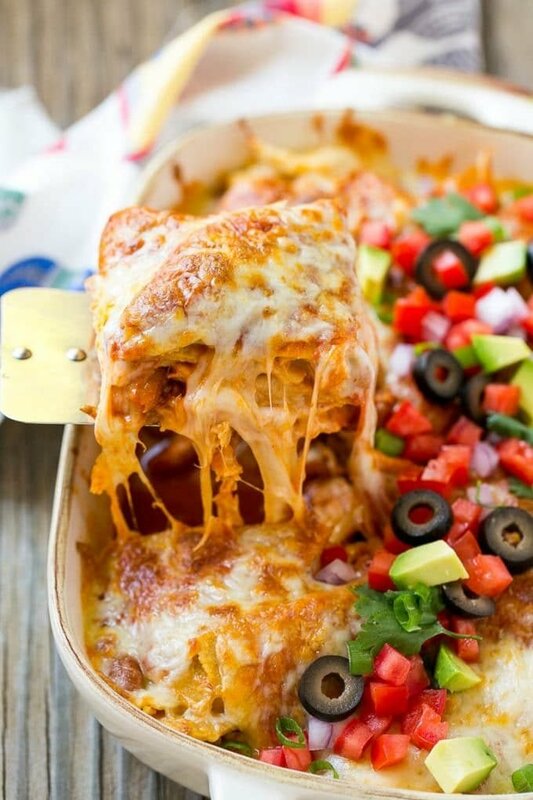 I make Mexican food for dinner at least once a week, I often whip up shrimp tacos, pork carnitas or this fabulous enchilada casserole. Add your favorite toppings and watch the rave reviews come in! Sometimes there’s just nothing better than a piping hot casserole, loaded with cheese of course! 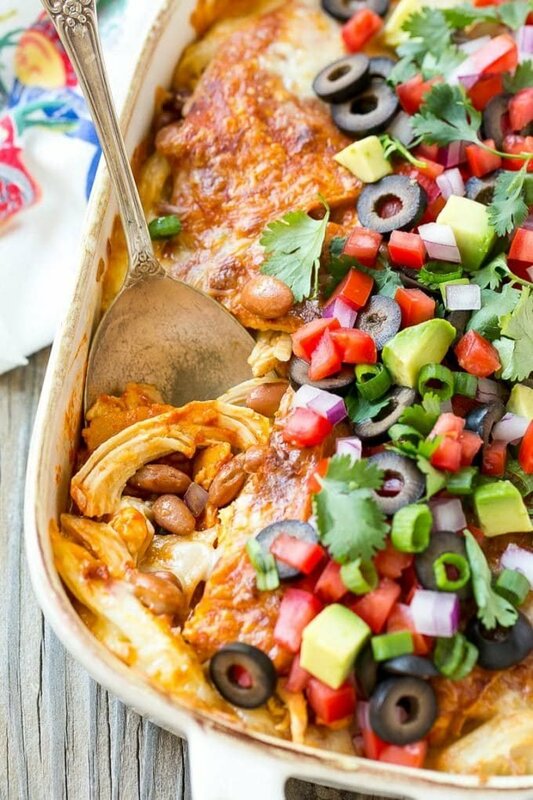 This easy chicken enchilada casserole is so simple to put together, but really delivers in the flavor department. I love Mexican food, especially enchiladas but sometimes I just don’t have the time to individually roll a million enchiladas. This casserole has all of the same flavors in half the prep time. 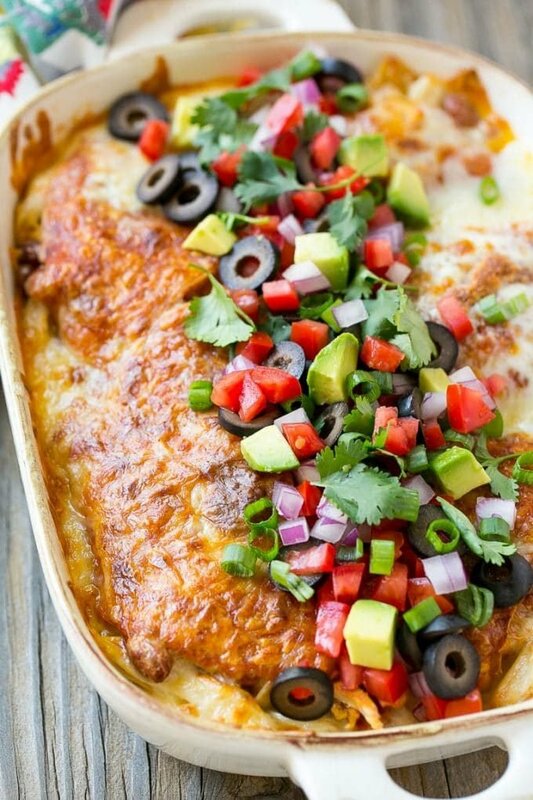 How do you make chicken enchilada casserole? 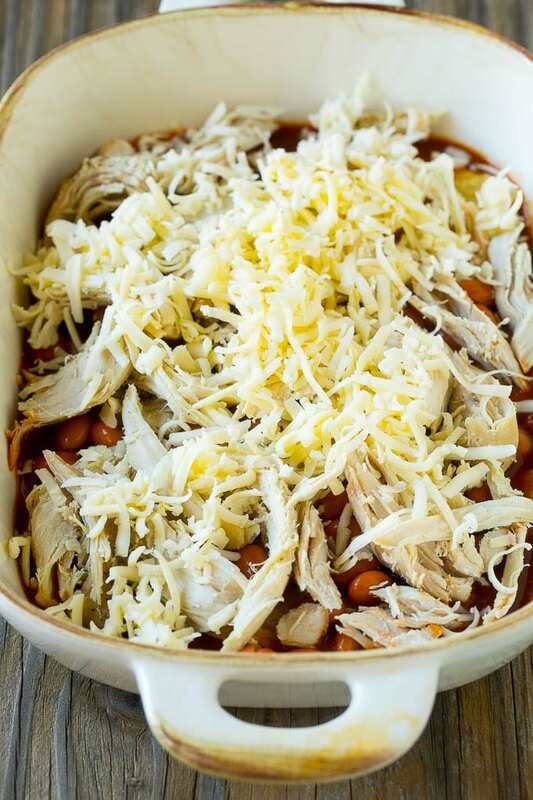 There’s just 5 ingredients in this chicken enchilada casserole – chicken, tortillas, beans, cheese and enchilada sauce. Everything gets stacked together in layers in a casserole before it’s baked to golden brown perfection. You can use any type of cooked chicken for this dish. I typically use leftover diced chicken or shredded rotisserie chicken. You can also roast chicken for this recipe, or put some chicken breasts in the slow cooker. This casserole can be assembled up to 4 hours before you plan to serve it. I recommend grating your own cheese for this recipe – it’s a little more work, but freshly grated cheese melts a lot smoother than the pre-shredded kind in a bag. This recipe can easily be doubled to feed a large crowd. There are so many different ways to customize this casserole to your preferences! Protein: Try using ground turkey, beef or shrimp instead of the chicken. Beans: Refried beans and black beans work well if you don’t have pinto beans on hand. Tortillas: This recipe works well with both corn and flour tortillas, so choose whichever one your family prefers. Cheese: I typically make this dish with Monterey Jack cheese, but other great options are cheddar, mozzarella and pepper jack. Additions: You can add other ingredients to your casserole such as corn, green chiles, diced bell pepper or sauteed onions. I love to add toppings to my casserole after it comes out of the oven – it’s an optional step but it really makes this dish special! Some great topping ideas include avocado, olives, red onion, cilantro, tomatoes, sour cream or green chiles. This is a great recipe to have for those busy nights when you don’t have a ton of time to get dinner on the table. It’s a crowd pleaser for both kids and adults alike. Preheat the oven to 350 degrees. Coat an 8 or 9 inch square baking pan or 2 quart baking dish with cooking spray. Spread 1/4 cup of sauce over the bottom of the baking dish. Layer 4 halves of tortilla over the sauce so that the bottom of the pan is covered. Layer 1/3 of the chicken, 1/3 of the beans, 1/2 cup of the cheese and 1/3 cup of enchilada sauce over the tortillas. Place a second layer of tortillas on top and layer 1/3 of the chicken, 1/3 of the beans, 1/2 cup of the cheese and 1/3 cup enchilada sauce over the tortillas. Repeat this process one more time for the third layer. 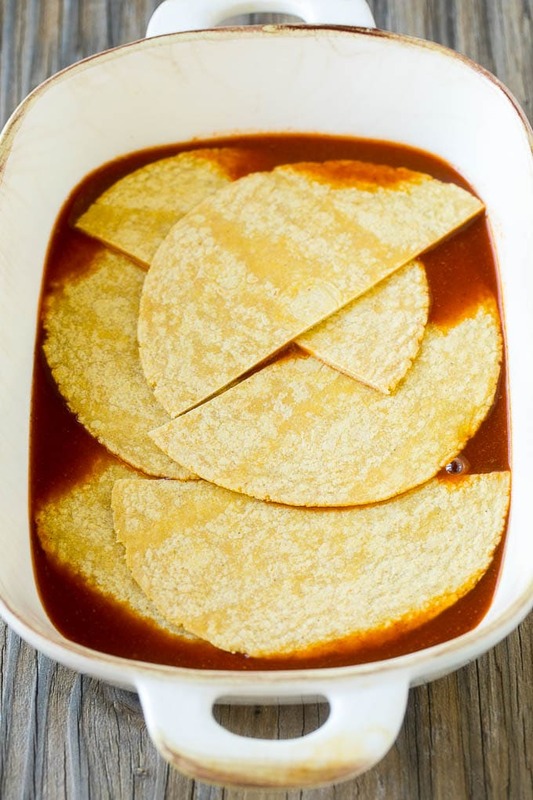 Place the remaining tortilla halves over the top and spread the remaining enchilada sauce over the tortillas. Sprinkle the remaining 1/2 cup cheese over the top. Cover with foil that's been sprayed with cooking spray and bake for 30 minutes. Uncover and bake for an additional 5-10 minutes or until cheese is melted and browned. Let sit for 5 minutes to firm up, then top with garnishes and serve. 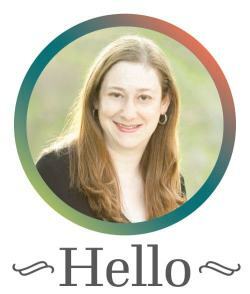 This post was originally published on September 19, 2016 and was updated on March 19, 2019 with new content. I’m a big foodie. This seems like a must try recipe. Will surely try it. omg my mouth is watering just looking at this! must try this recipe. it looks delish! What a tasty dish; a real crowd pleaser, indeed! I am adding this to my dinner lineup for the week! Oh my goodness! The moment I saw the title of this post I told myself: “I’m going to love this recipe!” Then, I saw the photos and I immediately started drooling. How deeeelish! Can’t wait to try this out.